Shake well and dispense into hands. Apply evenly to clean, damp hair. Style as usual. 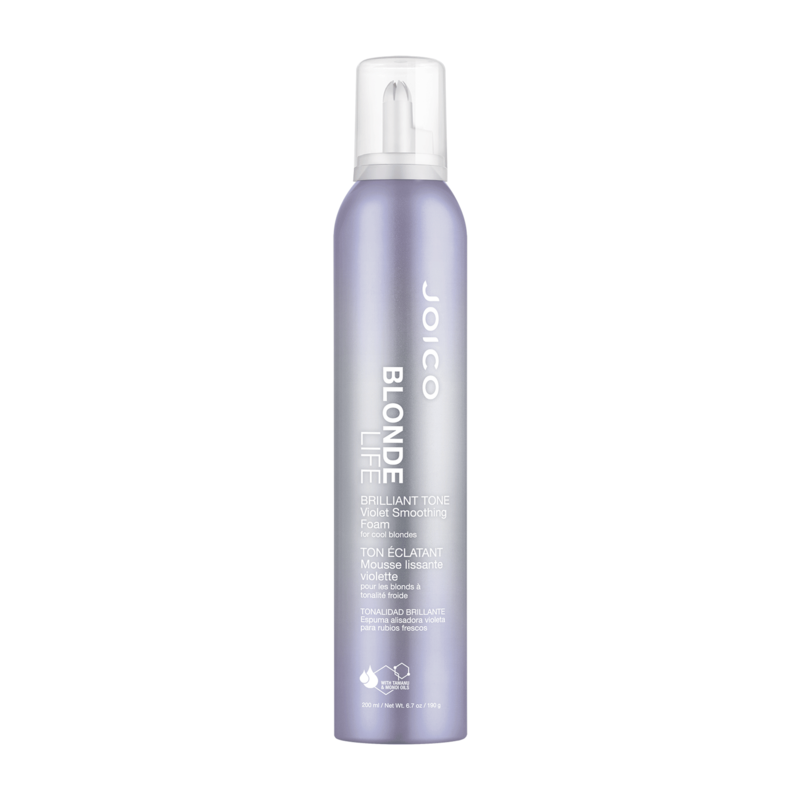 To use Brilliant Tone Violet Smoothing Foam with Brilliant Glow Brightening Oil: Apply Brilliant Tone to damp, towel-dried hair, then follow with a small amount of Brilliant Glow to damp hair. Style as usual. If desired, reapply Brilliant Glow to dry hair for a shinier nish. Natural, exotic oils pair with our most fortified, hair-healing ingredients and a light violet hue to create a multitasking styler that delivers the coolest, smoothest blonde around. MONOI OIL, a rare, exotic blend of Coconut Oil and Tahitian Gardenia Flower, helps ght frizz and boosts shine while protecting hair from environmental damage. TAMANU OIL, a rich, Southeast Asian UV-absorber/oil packed with fortifying Omega-6 and -9, helps deeply hydrate hair, bumps up shine, and banishes brittle strands. ARGININE, a naturally occurring amino acid crucial to hair’s strength, helps protect hair and reduce breakage. LIGHT VIOLET HUE, the ultimate balancing act, cools brassy blondes in a single shot. "I used this on a porous blonde. It toned the hair without turning blue Amazing scent Good hold without being to firm"
"Smooths and preps hair for a wonderful blow dry, and tones beautifully! Great product!" "This toned my hair really well without drying it out at all. It smells great and helped reduce some of the frizz I normally have after a wash. Would highly suggest to anyone looking for a quick and easy way to tone blonde hair."